Pro Se Productions, a leading publisher of Genre Fiction, proudly announces the debut of author Greg Norgaard’s latest book. The creator of Savage Noir, Norgaard introduces yet another hard boiled character into a world of murder and crime. The Cowboy Detective: A Matter of Terror is now available in print and digital formats. From the moment a crazed Nazi Doctor set foot in Chicago, he knew he was in the right place to finish the experiments he had started but never completed. His work began at a death camp, a camp of horrors in which he reigned with his own brand of terror. As soon as he committed his first act against an unsuspecting woman in the city, he knew there'd be a price on his head, and he didn't care. For this Nazi had the most beloved memory a man can have . . . the feeling of exhilaration as another's fear turns to panic. Below the rough underbelly of the city, there exists stalwart Detective Glenn Stroud. An efficient, dangerous, and committed cop who has always sought the evils that roam his town and threaten those closest to him. With his skills with a gun, his partner E Dent, and a souped up Pontiac Chieftain, Detective Stroud will search for the maniac while following the clues. His determination will lead to the end of this kidnapping and torturing psychopath . . . that, or he’ll lose everyone dear to him. The Cowboy Detective: A Matter of Terror by Greg Norgaard (Savage Noir), featuring a fantastic cover by Larry Nadolsky and print formatting and logo design by Percival Constantine, is available on Amazon now at http://www.amazon.com/Cowboy-Detective-Matter-Terror/dp/1518690874/ref=sr_1_1_twi_pap_2?ie=UTF8&qid=1447088068&sr=8-1&keywords=cowboy+detective+matter+of+terror and Pro Se’s own store at www.prose-press.com for 10.00. 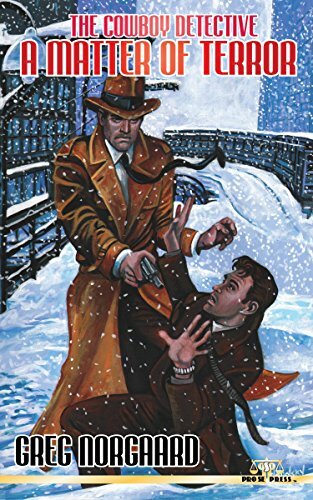 Norgaard’s latest work is also available as an Ebook, designed and formatted by Forrest Bryant and available for only $2.99 for the Kindle at http://www.amazon.com/Cowboy-Detective-Matter-Terror-ebook/dp/B017ODJ68C/ref=tmm_kin_swatch_0?_encoding=UTF8&qid=1447088068&sr=8-1 and for most digital formats via Smashwords at https://www.smashwords.com/books/view/590928.